Our feet were screaming for respite, our palates in need of something sweet, and our body craved for a warm cuppa, after that trek to admire the bamboo groves, Arashiyama and Katsura River. Right along the street from Saga-Arashiyama station to Tenryu-ji is Sagano-Yu Cafe Style Resort 嵯峨野湯, a public bathhouse turned cafe. 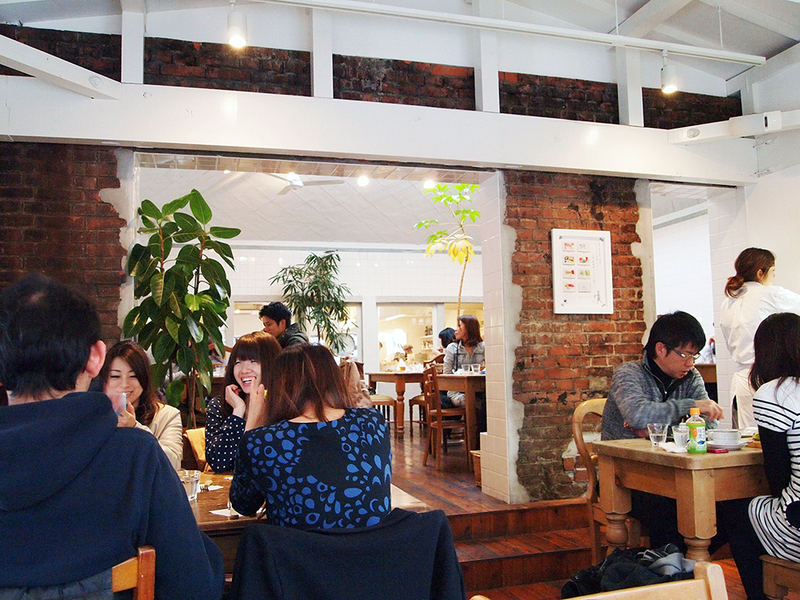 Don’t be fooled by the spotless exterior of Sagano-Yu Cafe. It was built in 1923 as Sagayu Bathhouse and refurbished into a teahouse in August 10, 2006. Beyond its cool white doors are warm wooden furniture, exposed bricks, quiet conversations and shared laughter. We had to put down our names on the waiting list, as there was a queue of like-minded, tired people wanting a table. While waiting, we wandered up the steep stairs to the 2nd level where you would find a little space selling a plethora of handmade goods – from accessories and knits, to kitchenware and food. We were intrigued by the rustic display at the bottom of the stairs, but disappointingly, it’s not as well stocked, or as interesting as the zakka shop down the road. I think that’s why we were the only 2 souls up there, after climbing gingerly up and down the narrow and steep stairs. The waitress sat us at a table near the windowed terrace, where a young Japanese maple tree is growing. This terrace might have been the exact spot where the open-air bath used to be. We spotted white bathroom tiles, a long sink and a water tap. Against the white tiles, the Japanese maple tree has another kind of magnificence, and so I clicked away with my camera at its crimson beauty. pling thinks that it is charming to have preserved some facets of the old bathhouse (including this old locker cupboard right at the kitchen window), and mingled them with modern wooden furniture to add even more character to this refurbished cafe. They let in a lot of natural light to create a homely feeling too. I ordered the Arashiyama Castella Pudding (¥600) and a hot pot of Darjeeling Morning Dew (¥650) to balance the sweet with a touch of smokiness. Cafes earn more brownie points when they have teapot cosies to keep my tea warm in this cold weather. My friend ordered a large bowl of green tea latte (¥680), and I mean it, it was a BIG BOWL. The Castella Pudding was just gorgeous! Sandwiched in between a slice of castella cake is a spread of creamy pudding. Oven it, and then torch it after a sprinkling of sugar, and you have this crispy moist texture and warm sweetness. This cake spoon is great for cutting the slice into bitefuls and scooping it into your mouth. I love it when cafes and restaurants consider these tiny details, but sadly, it doesn’t work well for left-handers like me. Of course, they serve the usual fare of pasta, Japanese curry and pancakes (explore menu here), but it was teatime for us! It’s only during weekends and travels that one gets to indulge in leisurely teatimes, no rushing back to work, or dashing off to the next appointment. So, step in, rest your feet and have a warm cuppa after that trek up Arashiyama. From Kyoto Station, take the JR Sagano line (Platform 32, 33) to Saga Arashiyama Station (嵯峨嵐山駅). The train ride takes about 20 minutes. Exit the station and take the road directly facing the exit of the station. There are signs along the road to indicate the way to Tenryu-ji. Follow that, and keep your eyes peeled to the left of the direction you are walking. It’s about 1-3 minutes walk from the station. If you are going to the cafe after you have finished Tenryu-ji, Sagano Bamboo Forest and Arashiyama, and walking back to the Saga Arashiyama Station, the cafe will be on the right.